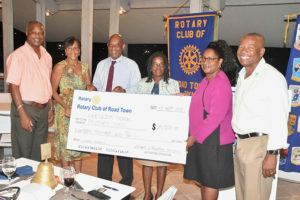 Road Town – – Rotary Club of Road Town in collaboration with the Salty Dawg Sailing Association donated $18k to the Ebenezer Thomas Primary School in Sea Cows Bay. The Funds are earmarked to assist the school with their rebuilding efforts in the wake of the 2017 hurricane season. On hand to receive the donation was Chief Education Officer Ms. Connie George who was both happy and grateful for the sizable cheque which she stated would immediately be put to great use. 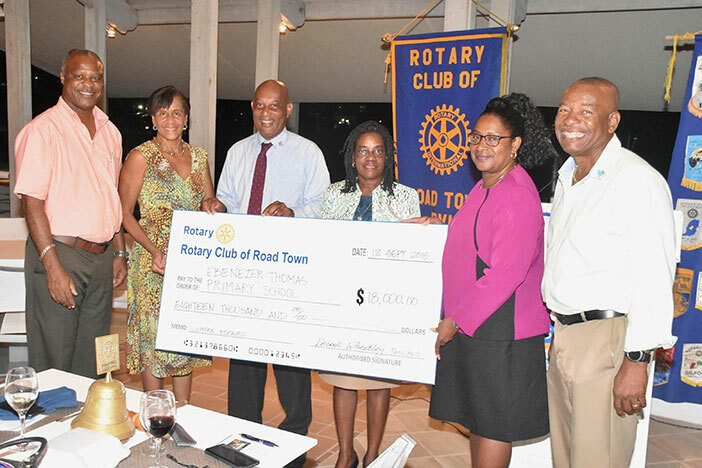 “The opportunity to collaborate with our community partners is at the heart of Rotary and we are always happy to get involved in projects that have a genuine lifelong effect in the BVI” stated current President of the Rotary Club of Road Town, Vincent Wheatley. The contribution was made possible by the Rhode Island, USA non-profit association- Salty Dawg. The Salty Dawg undertook a fundraising campaign to support Hurricane Irma Recovery efforts in the BVI in which they raised and donated a total of $30k for Hurricane relief. Rotary is a global network of 1.2 million neighbors’ friends, leaders, and problem –solvers who see a world where people unit e and take action to create lasting change-across the globe, in our communities and in ourselves.